On Thursday evening, a handful of coworkers and I set out on our way to Smyrna, Georgia. We’re fortunate enough to enjoy the luxury of traveling (at times) via the company jet, so it’s quick, easy, and our flight crews are always awesome! 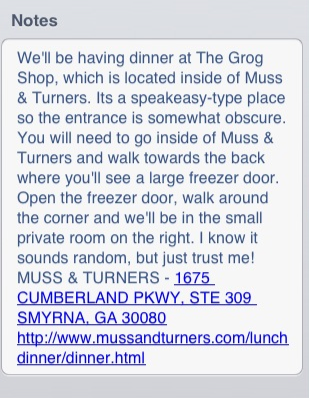 We arrived into the Atlanta area by 6PM and set off to meet the rest of our group at The Grog Shop at Muss & Turners. This is a sister restaurant to Local Three Kitchen & Bar in Atlanta, which I previously posted about – and in hindsight, could have easily included it in the the 2012 Faves. What should have been a very quick ride over to the restaurant turned into a series of small adventures. As you can see, those were her words – verbatim. So, based on our trusty iPhones maps, when we ended up in the middle of a high-end neighborhood, we were all a bit suspicious, but not totally sure if we were lost. A coworker re-entered the address into her phone’s navigation system, and we drove throughout suburbia, ending up in another neighborhood. (author’s note: I was in the third row, back seat, and therefore was totally out of the loop in terms of navigation (innocent party here!)). At this point, we were about to turn on the charm and just walk up to some unassuming family and invite ourselves to dinner! We finally tried the street address one last time, and found that we were less than a mile or so away, but had to drive about 5 miles (through suburbia again) to get there! And, yeah, it would have been a very quick drive over to dinner from the hangar. Yet, at this point, we were approximately 10 minutes late! We did finally arrive at our destination! Once we got there, the instructions seemed a bit less intimidating. 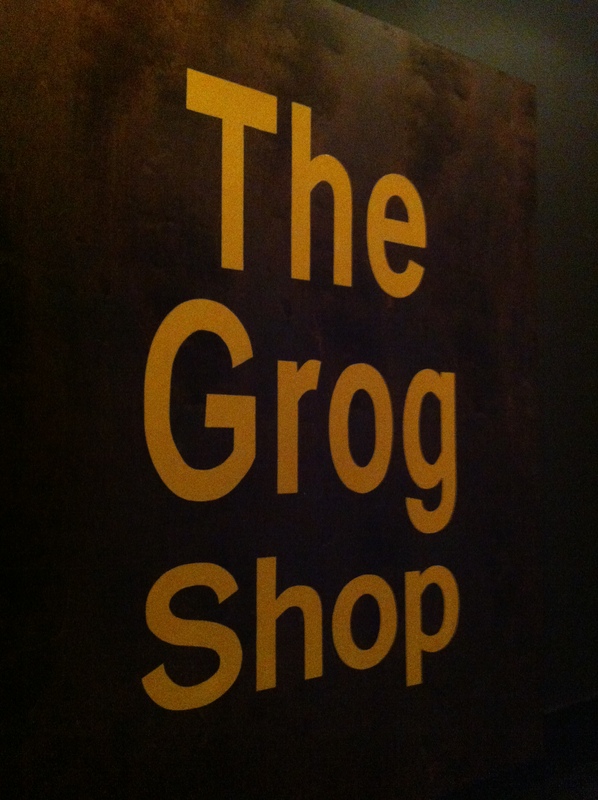 We did find the freezer door, and the hidden room, and saw seven of our ATL-based coworkers waiting for us in this charming little spot called The Grog Shop. I admit that after the drive I was feeling a bit queasy, and after day four of “Insanity: The Asylum, volume 2”, I was feeling sore and tired! I mention this because I was not my typical and engaging self at dinner. I was BEGGING for UNsweet tea (no, being in the South did not convert me to drink 1/2 tea and 1/2 simple sugar! 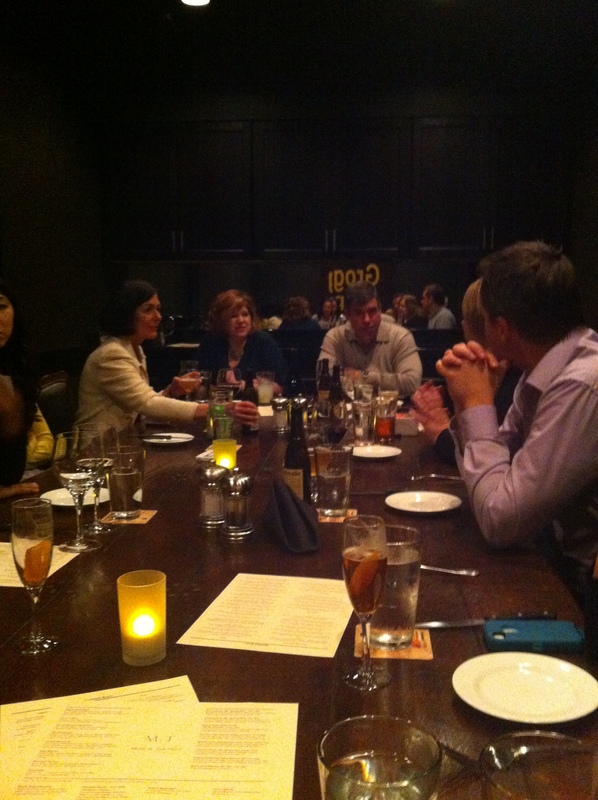 ), and I did not partake in the cocktails, beer, or wine that my coworkers ordered (and reportedly enjoyed). El’s Wings, which are described as crispy fried chicken wings, ras-el hanout spice, lemon, cucumber yogurt sauce. They had a strong curry smell, but the flavor was not overwhelming. Our newest team member was wise enough to order the Beef Cheek Ragout as well. 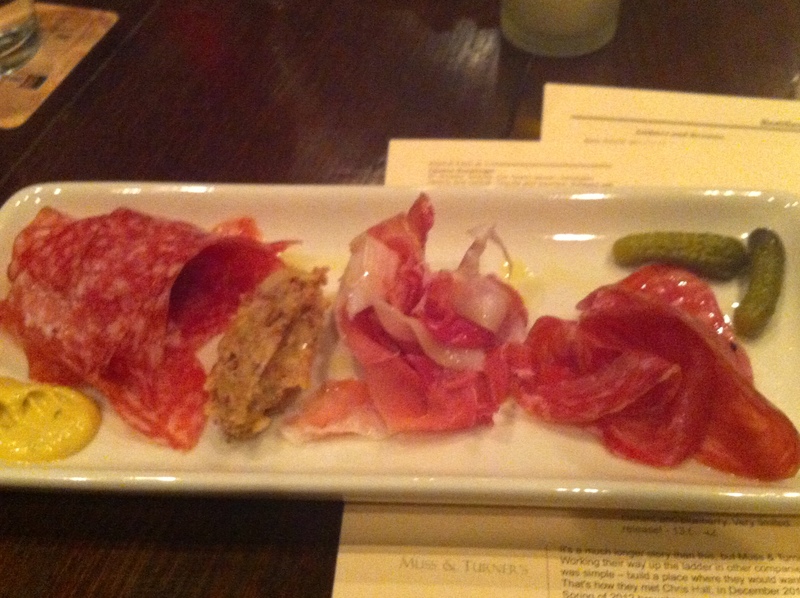 A delicious appetizer! I tried to grab a few more pictures, but apparently my group’s treks around the local neighborhoods left everybody (including those waiting on us) famished! Folks dug in! It actually took me over 30 minutes to gain everyone’s attention to raise a toast to the fact that we were all together again! That’s not typical! After the appetizers, Scully (whose name was a mystery still) brought an order of the Grilled Hudson Valley Duck Breast for me. 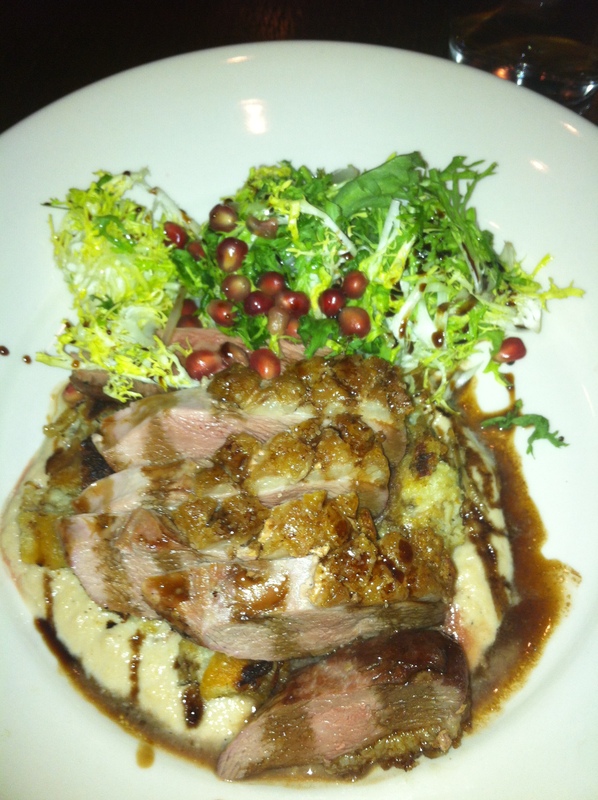 I would say that it was divinely prepared duck over super tasty stuffing – excellent flavors! The menu describes the dish in a much more specific and eloquent way: griddled farinette cake, turnip puree, bitter green salad, balsamic pomegranate reduction. Scully told me that this is her favorite dish, and I can certainly see why! The flavors were just intensely good! I also tasted a bite of my friend’s Steak Frites. It was another dish with outstanding flavor! Believe me, none of us left Muss & Turners hungry! 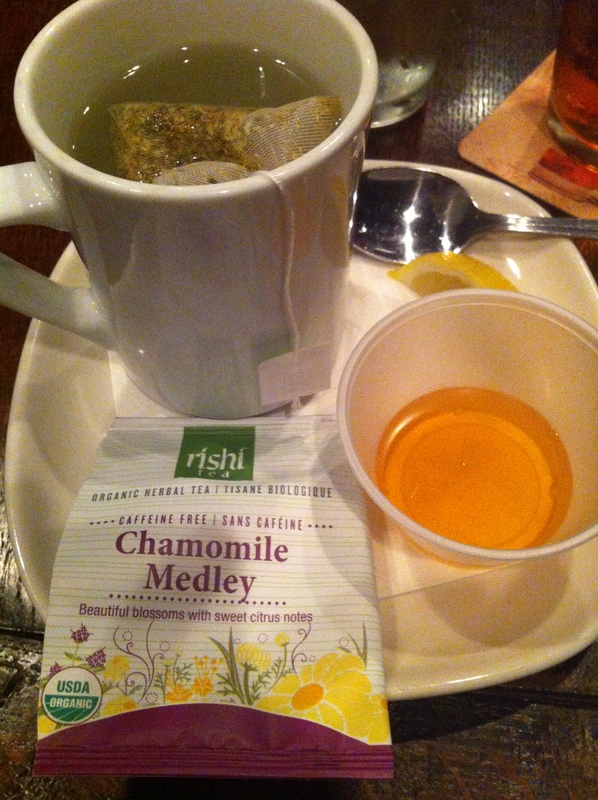 I ended the evening with a lovely cup of decaffeinated hot tea. I so appreciated that Scully presented me with a box full of options, and then delivered tea with all the right accessories. It was the perfect ending for this exhausted woman! I’d also like to mention that Muss & Turners is an avid supporter of Team HIDI, which is just another reason to love the owners and staff. A beautiful and loving show of support for a beloved community member – you don’t always see that type of action from businesses. Thank you for a great evening Muss & Turners!